© 2002, © 2019 by Paul Freeman. Revised 2/10/19. 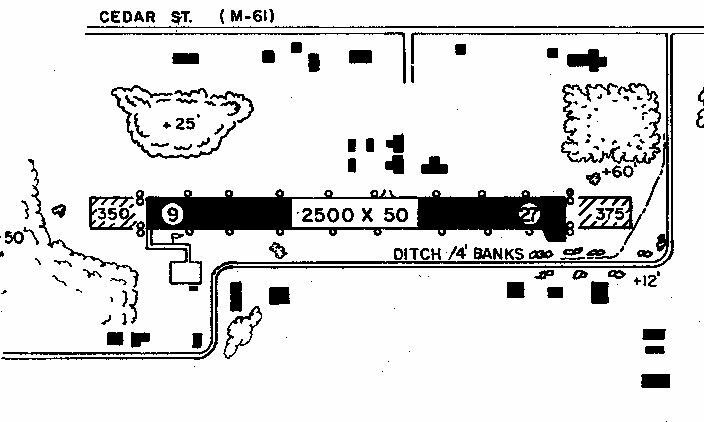 Wings Airport, as depicted on the June 1947 Milwaukee Sectional Chart. The earliest reference which has been located of St Johns Airport was an article entitled “St. Johns is set for model meet” in the 4/16/40 Lansing State Journal (courtesy of Bill Grasha). It described how a model airplane contest was to be held at the St. Johns Airport. However, St Johns Airport was not yet depicted on the February 1941 Milwaukee Sectional Chart. St Johns Airport still not depicted on the December 1946 Milwaukee Sectional Chart. described how the St. Johns Airport was owned by Floyd Wing. Wesley Clark was said to operation the C & M Flying Service at the airport. which depicted Wings as having a 2,100' unpaved runway. measuring 2,100' southwest/northeast & 1,800' northwest/southeast. A hangar, office, and a few other small buildings were depicted on the south side. Wings Airport was still depicted on the December 1948 Milwaukee Sectional Chart. as that is how it was labeled on the June 1949 Milwaukee Sectional Chart. 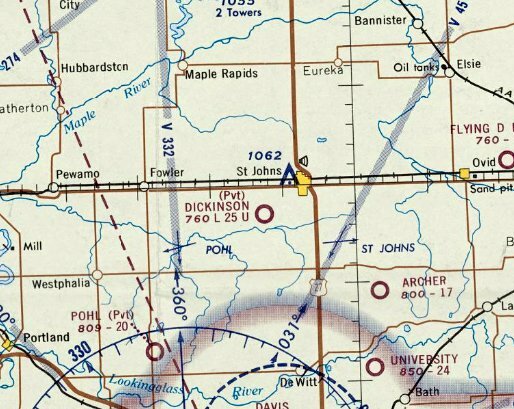 St Johns Airport was still depicted on the November 1954 Milwaukee Sectional Chart. as it was no longer depicted on the May 1955 Milwaukee Sectional Chart. 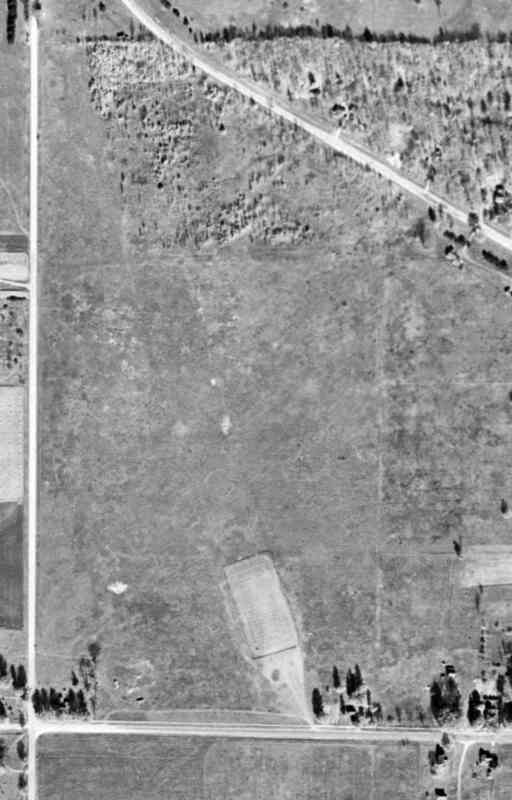 There was no recognizable sign of an airfield on a 1956 aerial photo. 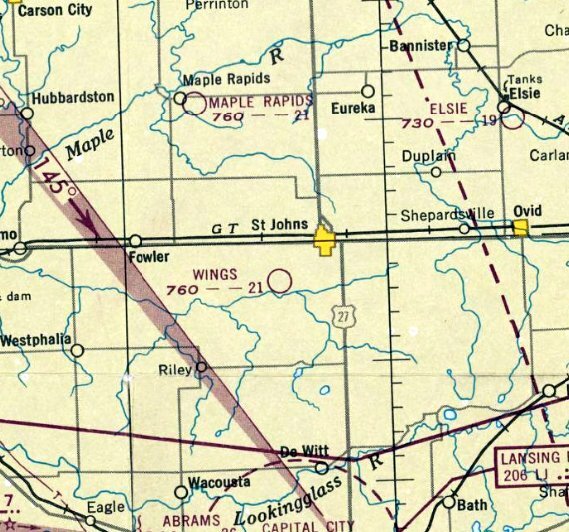 St Johns Airport was still not depicted on the May 1960 Milwaukee Sectional Chart. 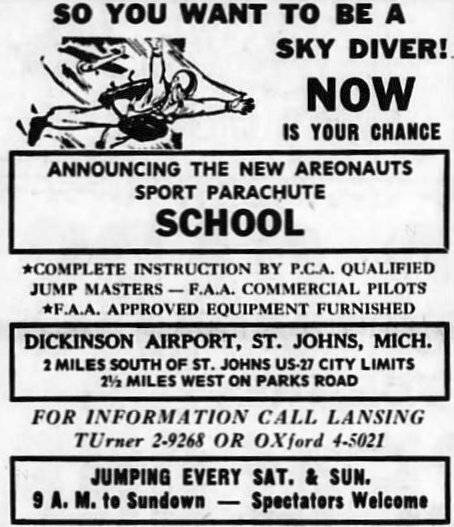 as that is how it was labeled in a 7/16/64 advertisement for skydiving (courtesy of Bill Grasha). It was depicted as Dickinson Airport on the May 1965 Milwaukee Sectional Chart. with 2 perpendicular unpaved runways, with a few small buildings on the southeast side. 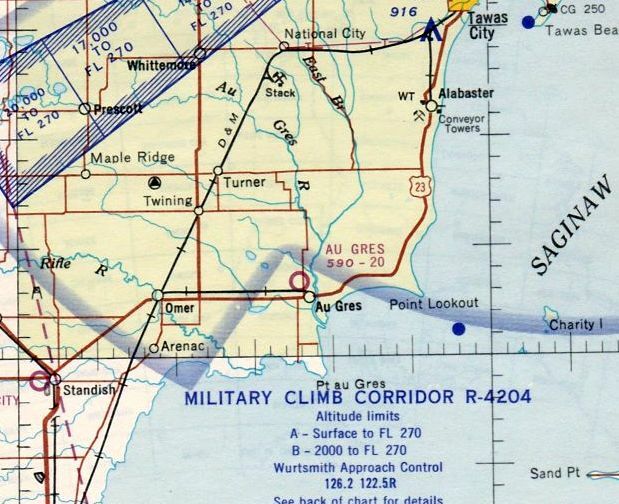 The last aeronautical chart depiction which has been located of Dickinson Airport was on the May 1970 Milwaukee Sectional Chart. It depicted Dickinson as a private airfield having a 2,500' unpaved runway. The last reference which has been located of Dickinson Airport was an article entitled “Air Tour Set Saturday” in the 10/7/71 Lansing State Journal (courtesy of Bill Grasha). as it was no longer depicted on the 1974 USGS topo map. 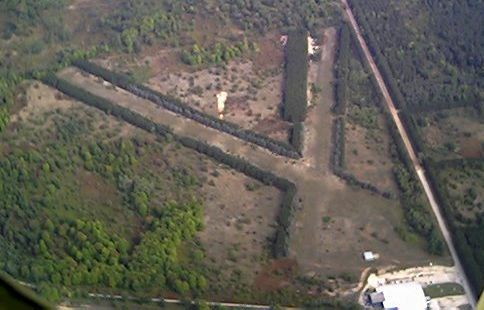 There was no recognizable sign of an airfield on a 1981 aerial photo. A 2015 aerial view looking north showed no trace of Dickinson Airport. The site of Dickinson Airport is located south of the intersection of West Townsend Road & Airport Road, appropriately enough. Thanks to Bill Grasha for pointing out this airfield. A postmark commemorating the 7/4/31 dedication of Poschke's Harbor Beach Airport (courtesy of Bill Grasha). According to “Harbor Beach 1837-1996” (courtesy of Bill Grasha), “In 1928 Otto Poschke bought a farm west of Harbor Beach & planned to build a home & an airport. 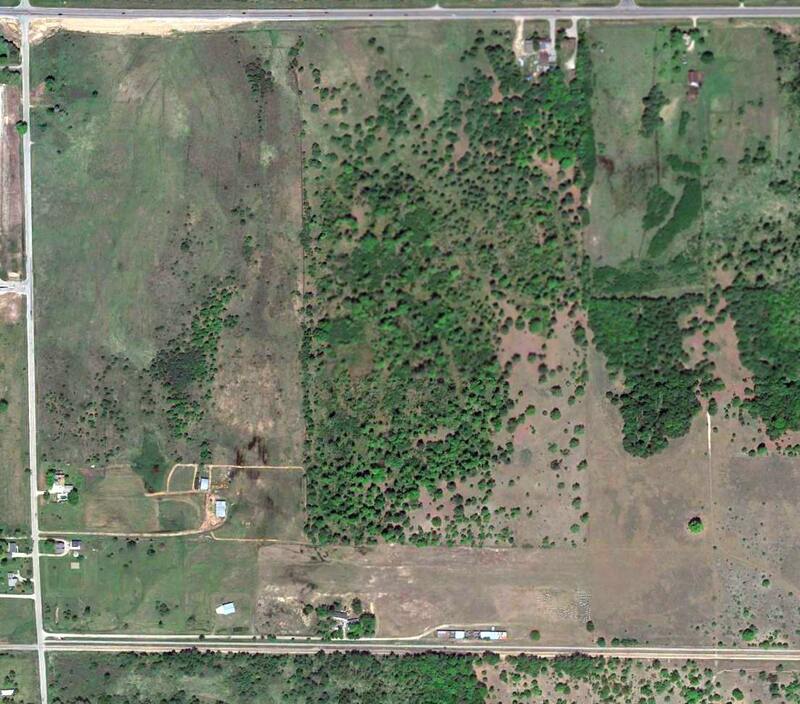 In 1929, forty acres of this land were plowed, leveled, and seeded for the airport. The aviation field was 80 rods square. An airport hangar was constructed near the road & a 40' steel flagpole was erected at the back of the property. showing a Bird biplane & Stinson monoplane in front of a large arch-roof hangar marked “Porchke's Harbor Beach Airport”. 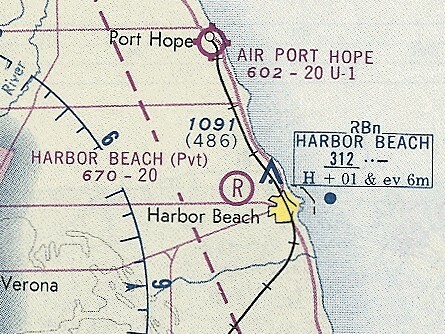 The earliest aeronautical chart depiction which has been located of Poschke's Harbor Beach Airport was on the October 1943 Detroit Sectional Chart (courtesy of Ron Plante). 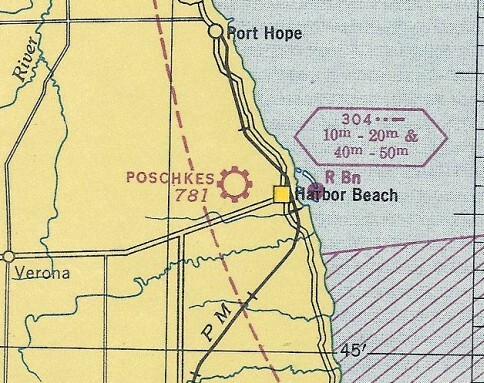 It depicted Poschkes as a commercial/municipal airport. with a hangar on the south side. 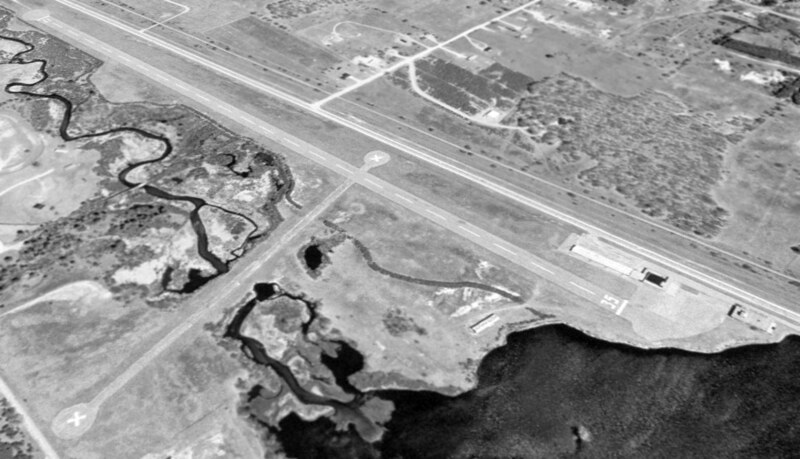 A 5/28/53 USGS aerial view showed the Harbor Beach Airport runways remained clear, and the hangar roof was still painted with a checkerboard pattern. The last aeronautical chart depiction which has been located of Harbor Beach Airport was on the November 1974 Detroit Sectional Chart (courtesy of Ron Plante). It depicted Harbor Beach as a private airfield having a 2,000' paved runway. as it was no longer depicted on the May 1981 Detroit Sectional Chart (courtesy of Ron Plante). A 1969 aerial view showed the Harbor Beach Airport runways remained clear, and the hangar roof was still painted with a checkerboard pattern. A 2016 aerial view of the site of Harbor Beach Airport shows that the runway area remains clear, though the runways themselves are no longer recognizable, with the area having been returned to cultivation. 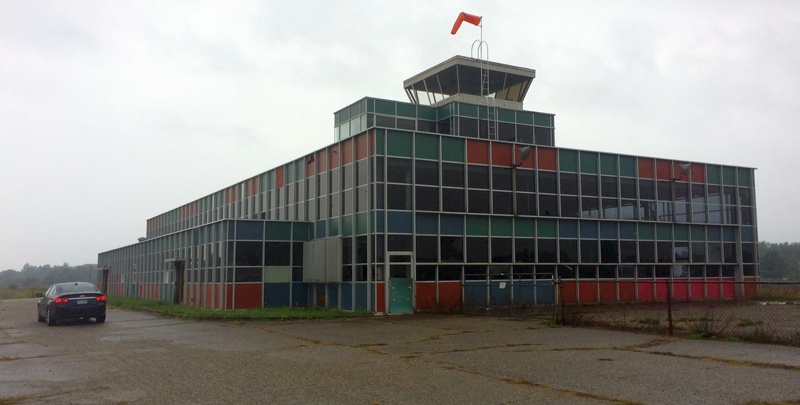 The airport's hangar remains standing along the south side, amazingly after 85 years. The hangar roof's checkerboard pattern is still recognizable, though faded. The site of Harbor Beach Airport is located northeast of the intersection of Section Line Road & Stafford Road. Alma Airport, as depicted in the 1947 MI Airport Directory (courtesy of Bill Grasha). 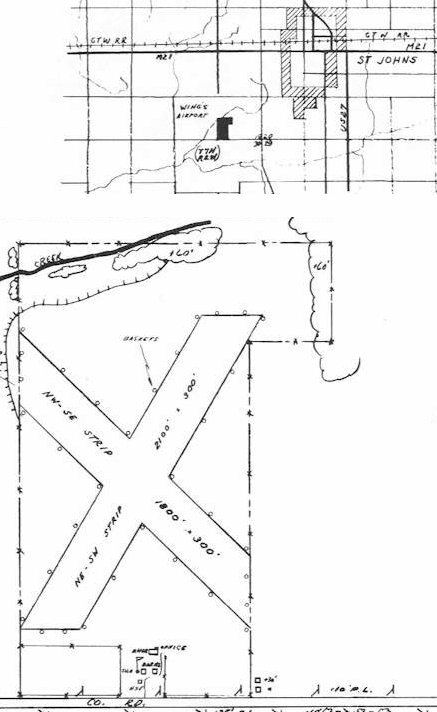 According to greatlakespilot.com, “The first airport in the Alma area was in an open field near Superior Street just north of the old Total Refinery. On 2/23/28, the growth & safety of aviation was the topic of conversation at the Alma Chamber of Commerce. 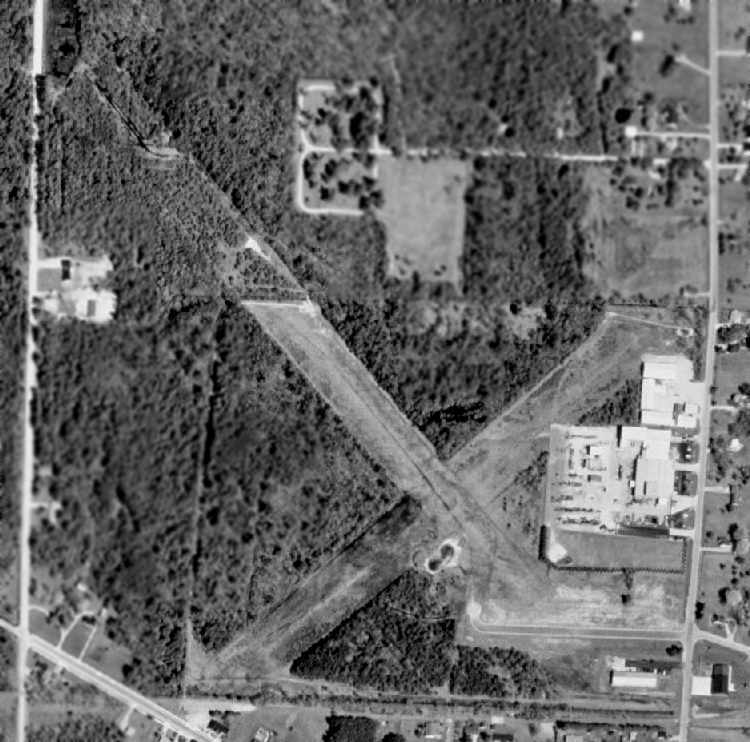 The second airport was the old Alma Airport or what was called Sharrard Field that most of the local people remember on Bridge Street behind the high school. The north/south runway was short & not used much. The east/west runway had the Pine River on the east & Bridge Street on the west. According to greatlakespilot.com, “On 5/17/28 an aviation club was started. H. H. Keating, the manager of the Saginaw District of Standard Oil was in town in the interest of aviation in Gratiot County. It was decided to form this club & establish a drive to find at least 100 members. Sharrard’s Field was really just a cow pasture with about 2,600' of runway. The barn had been converted into a hangar. It needed a lot of work to have bigger planes land there. Some of the first members were F.J. Lobdell, W.A. Barton, Gordon Brown, W.F. Renolds, Frank Parker & George Sharrard. The money raised by the membership pushed work on the field to make it the best in Gratiot County. The field was fine to fly small 2-place airplanes in & out but it didn’t work for larger ones. Dr. Jack Sanders used to fly a Stout Tri Motor & said it was difficult to land on a short runway. Plans were perfected & on 6/20/28 a Board of 10 directors were chosen. Renolds & Murphy were elected as secretary & Treasurer. The rest of the board consisted of Babcock, Swartout, Faunce, Rodenmocker, Housel, and Parker. 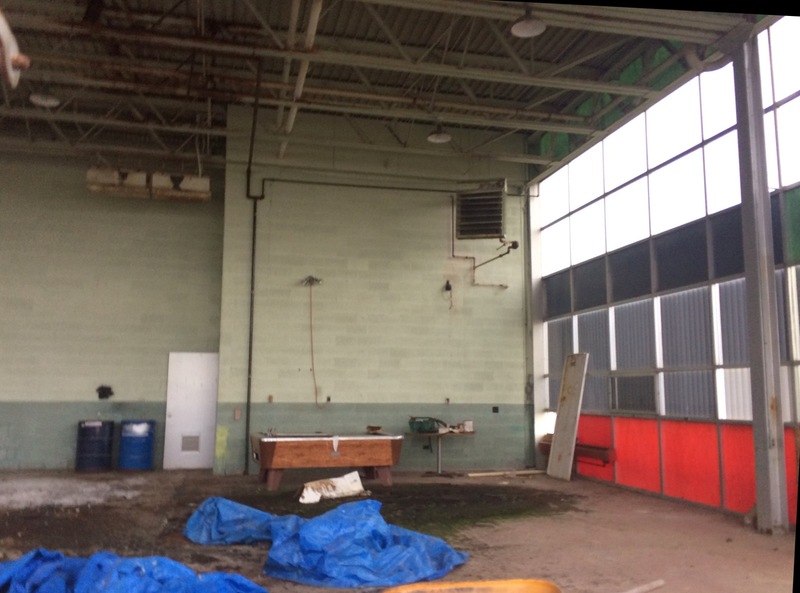 Just a few months later, disaster struck when the hangar caught fire & burned. Three airplanes burned, two of which belonged to W.A. Barton & Gordon Brown who had done much to promote aviation in this area. According to greatlakespilot.com, “On 6/6/29, the airport was finally ready to land larger aircraft despite the rains interfering with grading operations. The field was completed & an all-steel hangar was erected. Planes were already using it & plans for an aviation day were in the making. It was thought to be the best field in the state because it was high & dry which assured safe landings & easy takeoffs. The earliest depiction which has been located of Alma Airport was in the 1947 Michigan Airport Directory (courtesy of Bill Grasha). It depicted Alma Airport as having 2 gravel runways: measuring 3,200' east/west & 2,000' north/south. An office & hangar sat the southwest of the runway intersection. was on the May 1953 Milwaukee Sectional Chart. It depicted Alma Airport as having a 2,500' paved runway. 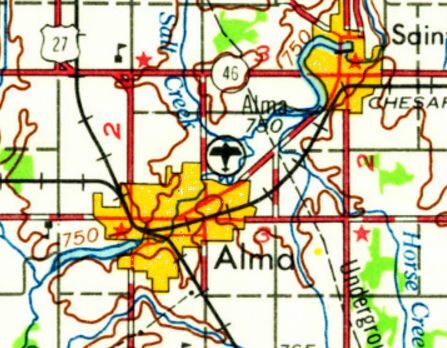 The last depiction showing Alma Airport still in operation was on the 1959 USGS topo map. 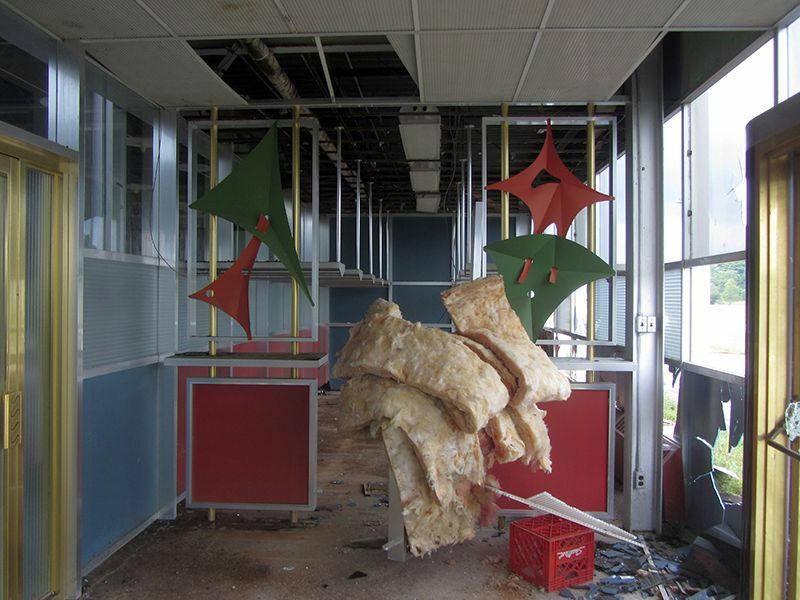 According to greatlakespilot.com, “In the late 1950s / 1960s an idea of a new airport was being thrashed about. We had 2,600' of runway but needed 5,000-6,000' to land even larger planes that were being built. The original Alma Airport was presumably closed upon the opening of the new airport. 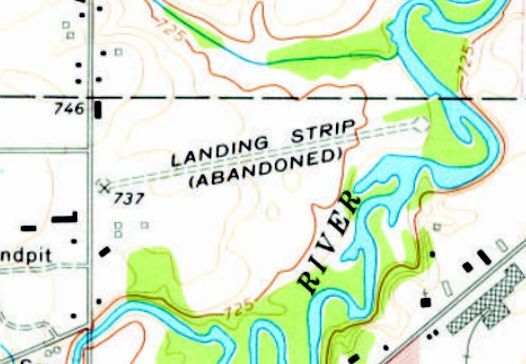 The 1973 USGS topo map depicted Alma Airport as a single unpaved northeast/southwest runway, labeled as “Landing strip (abandoned)”. 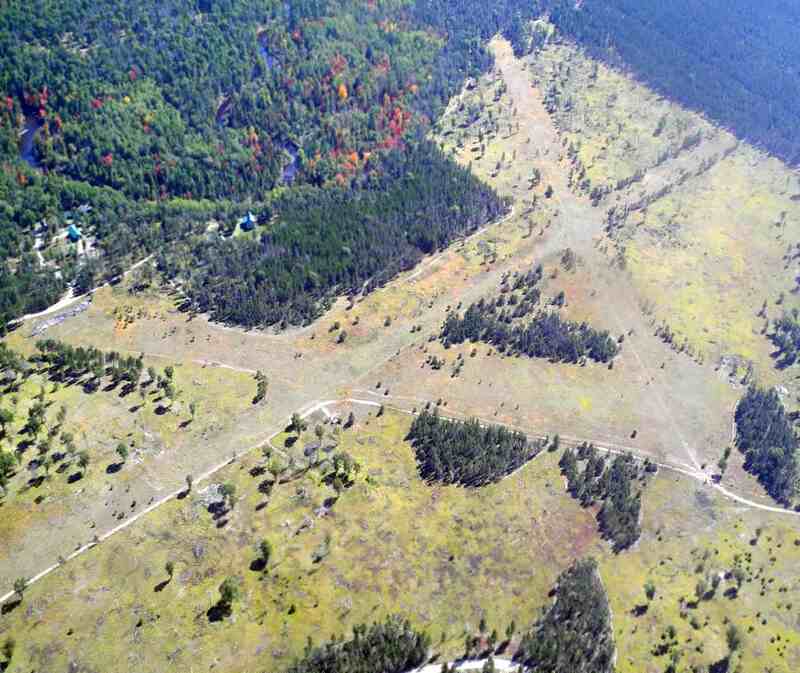 A 9/21/15 aerial view of the site of Alma Airport (courtesy of Bill Grasha). 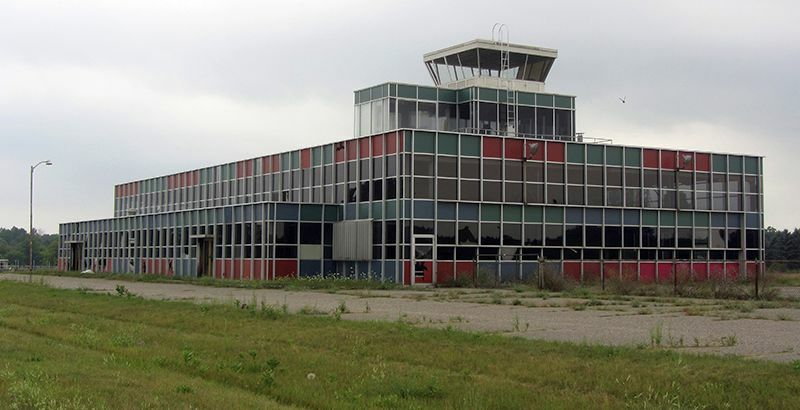 Bill Grasha observed that the location of the former east/west runway is occupied by a road named Willow Run Drive, maintaining an aviation theme on the property. 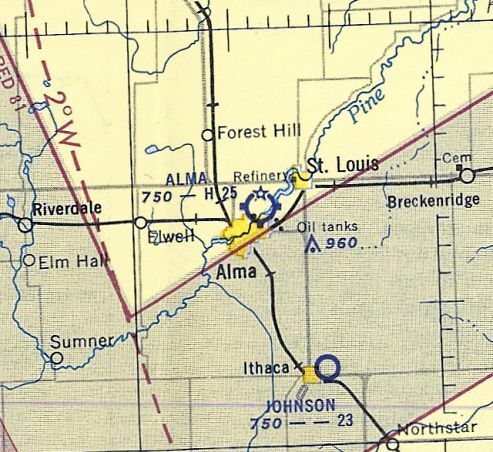 The 1947 MI Airport Directory depiction of Alma Airport, overlaid by Bill Grasha over a 9/21/15 aerial view of the site. 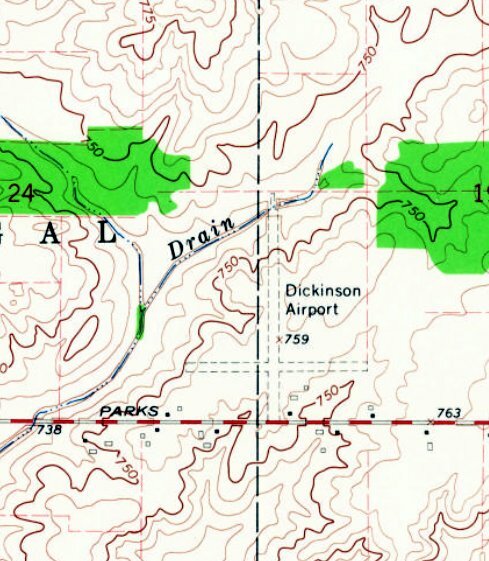 Miller Airport, as depicted on the 1959 USGS topo map. According to its FAA Airport/Facility Directory data, Miller Airport was activated in August 1956.
who manufactured various glass & aluminum products. which was a big social event for Reed City, with a sit-down dinner catered by the Osceola Hotel & music by the Les Elgart Orchestra. “Many residents will remember the excitement caused by the Dawn Patrols held at Miller Airport, generally around Labor Day. It was great fun watching the many planes land that arrived here for the event." There was also a popular pancake breakfast afterward. 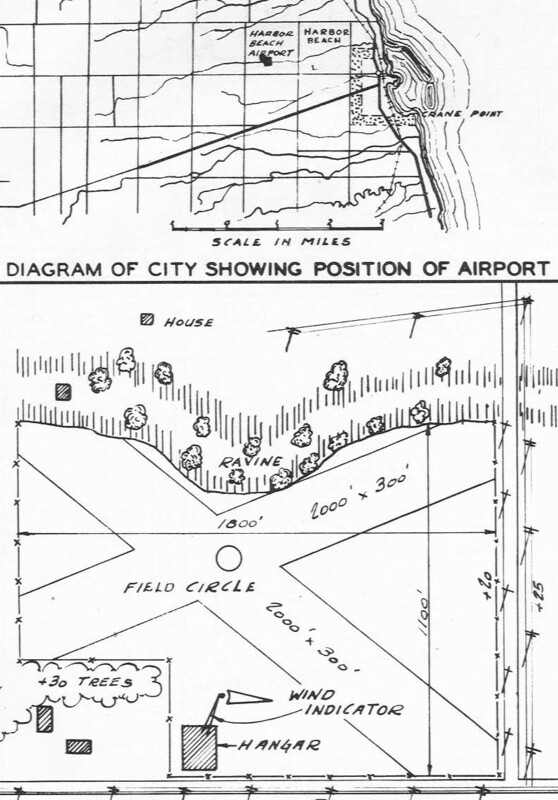 The earliest depiction which has been located of Miller Airport was on the 1959 USGS topo map. It depicted Miller Airport as having 2 paved runways, with 2 buildings on the southeast side. According to Wikipedia, “Miller Airport... was purchased by Nartron Corporation in the 1979 to house its engineering & manufacturing operations. Advanced Product Development & Wire Products Assembly occurred at this location until the late 1980s. These operations have since been moved to another location”, presumably Nartron's Corporation's facility just to the north of the airport. 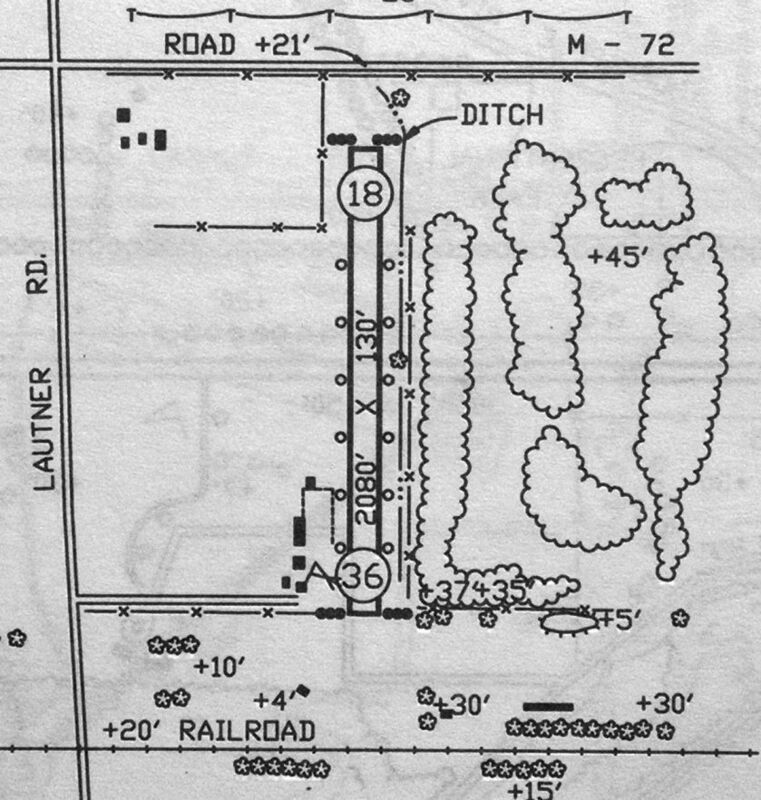 The 1987 USGS topo map depicted Nartron Field as having 2 paved runways, and a ramp with 2 buildings on the southeast corner. 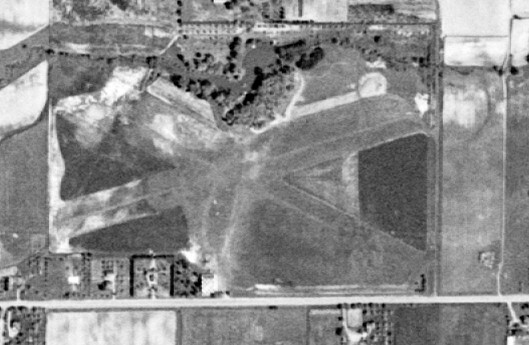 The earliest photo which has been located of Nartron Field was a 1999 USGS aerial view looking northeast. Runway 17/35 was marked as an active runway, but the crosswind runway had been pained with closed-runway “X” symbols. Two buildings & a ramp were located on the southeast side, but there were no aircraft on the field. Nartron Field's FAA Airport/Facility Directory data said that it conducted a total of 5 takeoffs or landings in the year of 2013. 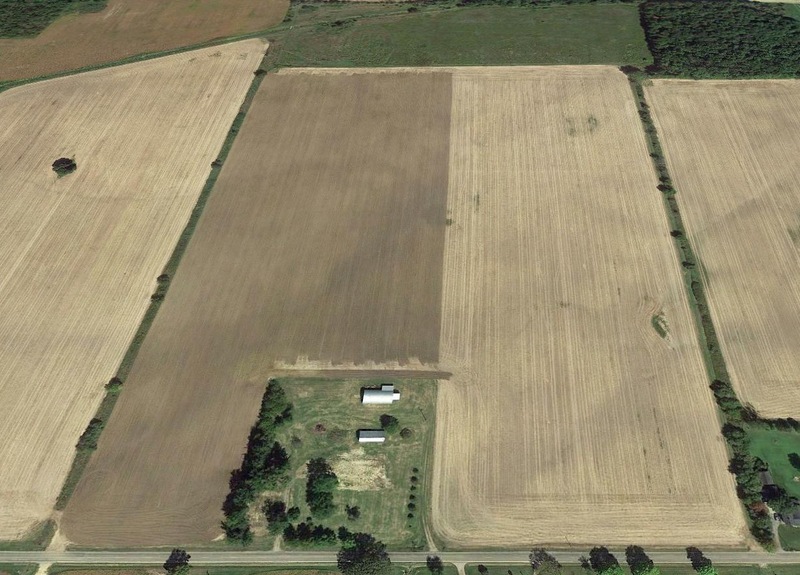 A 2016 aerial view looking northeast showed Nartron Field to be intact though deteriorated. The runway markings had been removed from Runway 17/35, and a storage lot for industrial equipment had been built on the western end of the former crosswind runway. with an abandoned crosswind runway. The manager was listed as Norman Rautiola. A September 2016 photo of Nartron Field's buildings. A September 2016 photo of a Nartron Field building. A September 2016 photo of the Nartron Field control tower. A September 2016 photo of some Eisenhower-era decor that graced the entryway to the Nartron Field building. 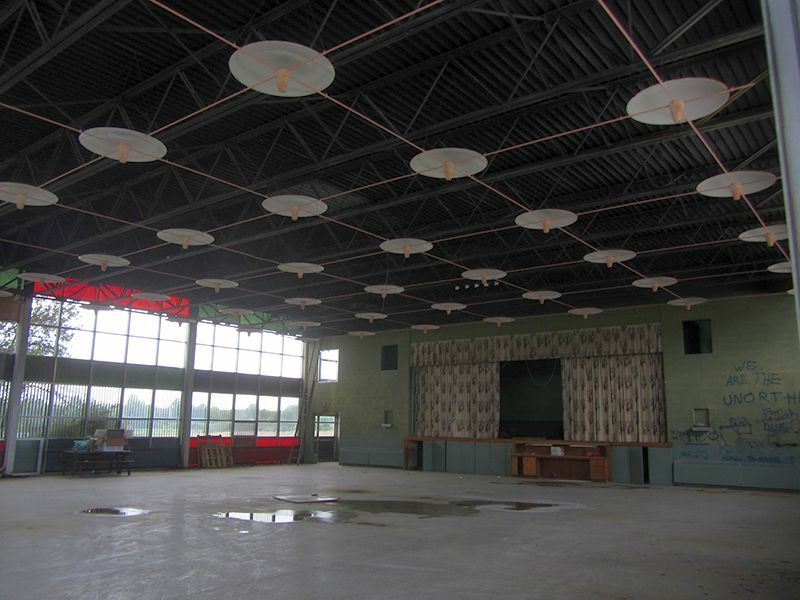 A September 2016 photo of the interior of a Nartron Field building, presumably the former Miller Auditorium. According to Wikipedia, as of 2017, “The only runway, 17/35, is in poor condition & the surface is cracked & scattered with stones. Vegetation grows through cracks. 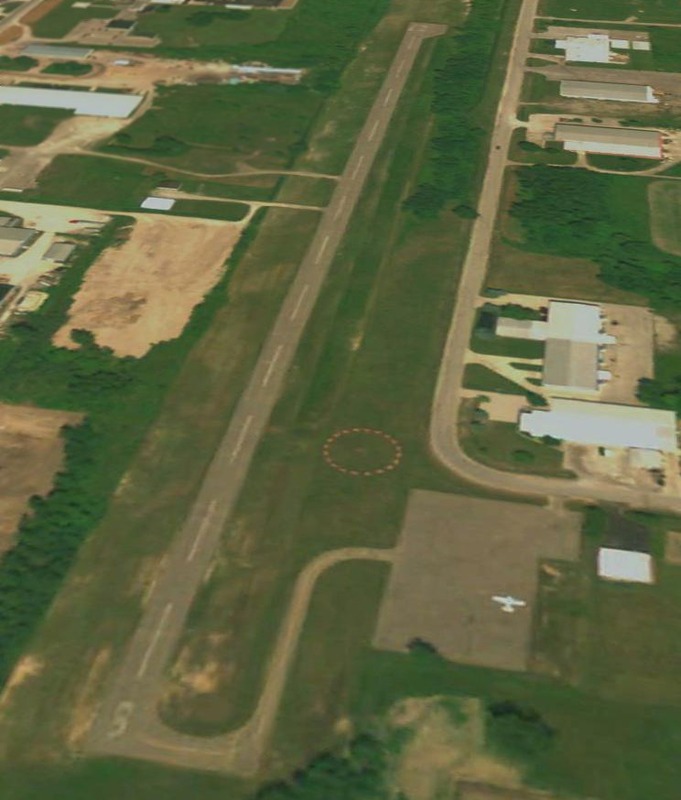 As of 2017, Nartron Field's FAA Airport/Facility Directory data described it as having a single 4,506' asphalt Runway 17/35, “in poor condition”. The owner & manager was listed as Norman Rautiola. A 9/4/17 photo by Matt Franklin of the Nartron Field terminal & control tower. A 9/4/17 photo by Matt Franklin of a Nartron Field hangar. A 9/4/17 photo by Matt Franklin of the interior of a Nartron Field hangar – complete with a pool table. 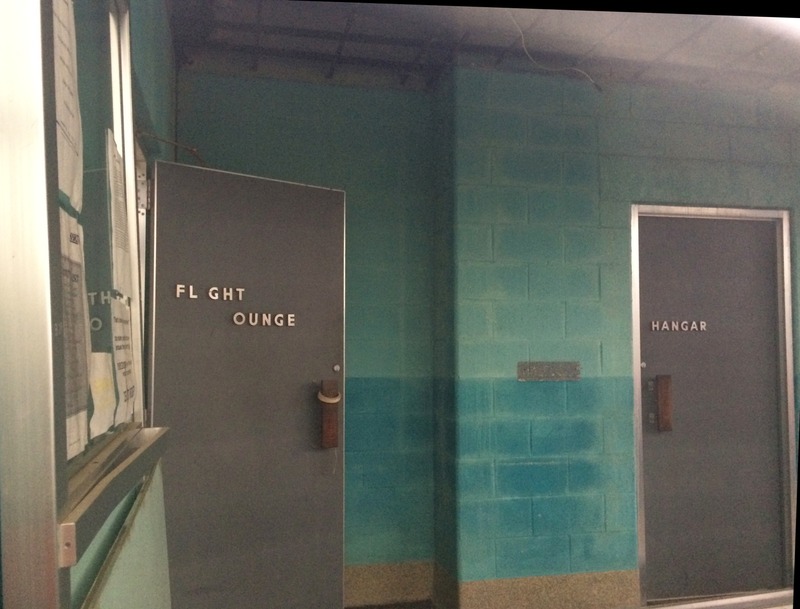 A 9/4/17 photo by Matt Franklin of the entrance to the Nartron Field Flight Lounge. Nartron Field is located southwest of the intersection of Old Highway 131 & West 6 Mile Road. 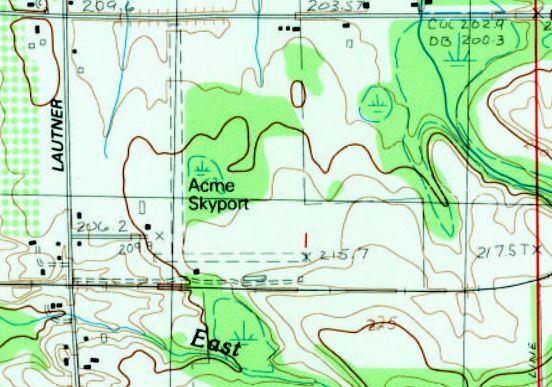 Acme Skyport, as depicted on the 1983 USGS topo map. 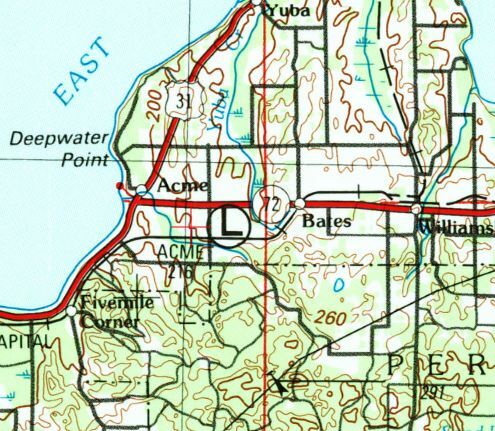 The earliest depiction which has been located of Acme Skyport was on the 1983 USGS topo map. with a few small buildings on the southwest & south sides. Marc Boudreau recalled, “Acme Skyport... I used to take my students over there from nearby TVC for soft field practice. There is a shorter private East/West runway that, oddly enough, was not technically connected to the North/South runway. Called Gramp's Acres or something similar on the charts, it was not part of the public-use portion. There was only one owner, but I just always assumed he preferred the public not use the rather short East/West runway. There was a difference in elevation between the south end of the North/South runway & the East/West one, which was a little lower. Uneven terrain between them, as well. The 1989 USGS topo map depicted “Acme” Airport as having 2 perpendicular runways. The March 1990 Airport/Facility Directory (courtesy of Marc Boudreau) described Acme Skyport as having 2 runways: 18/36 & 9/27. and cautioned that the E/W runway was closed. The only photo which has been located showing aircraft at Acme Skyport was a 1993 USGS aerial view. with 4 light single-engine aircraft visible parked to the southwest of the Runway 18/36. The only aeronautical chart depiction which has been located of Acme Skyport was on the 1993 MI Aeronautical Chart (courtesy of Marc Boudreau). It depicted Acme as having a 2,100' unpaved runway. as it was no longer depicted on the 1997 Michigan Aeronautical Chart (according to Marc Boudreau). A 2015 aerial view showed Acme Skyport to remain intact, though devoid of aircraft. A 3/20/16 photo by Marc Boudreau at Acme Skyport, “Looking west on Runway 27. The far end is not visible due to the sloping terrain. It looks like it might possibly still be maintained for someone's private use. No aircraft are visible, and a boat is stored in one hangar. although I remember 2 former metal T-hangar type buildings for maybe 5-6 airplanes each. A 3/20/16 photo by Marc Boudreau at Acme Skyport, “Looking northeast from the threshold of Runway 9 towards the 2 hangars to the northwest of the runway intersection. As of 2016, Acme Skyport was no longer depicted on aeronautical charts. John Gerty reported in 2018, “Acme Skyport... There was an airplane stored in the south hangar. They had it out last summer (2017) about the time the property was put up for sale. In nearly 4 years of living near the Skyport I had never seen the plane. However, the east/west runway has been consistently mowed & minimally maintained. There is a new windsock on that same south hangar & the Acme Skyport sign has been renewed with a fresh graphic. The site of Acme Skyport is located southeast of the intersection of Lautner Road & Route 72. Thanks to Marc Boudreau for pointing out this airfield. 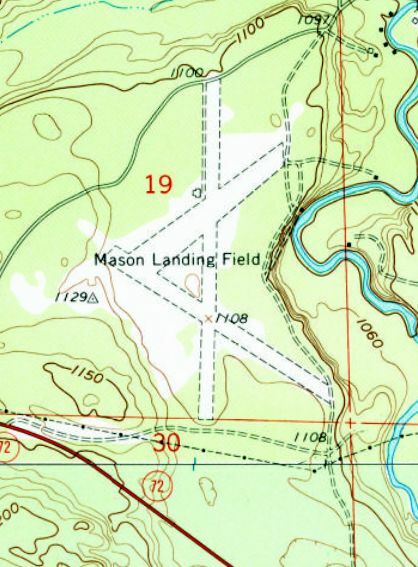 “Masons” Landing Field, as depicted on the 1954 USGS topo map. According to its FAA Airport/Facility Directory, this small general aviation airport in northern MI was activated in July 1942. 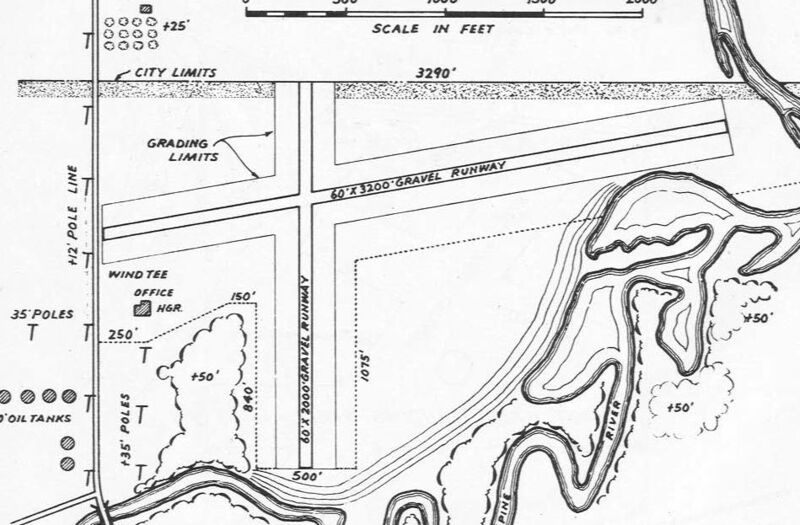 The earliest depiction which has been located of Mason Landing Field was on the 1954 USGS topo map. 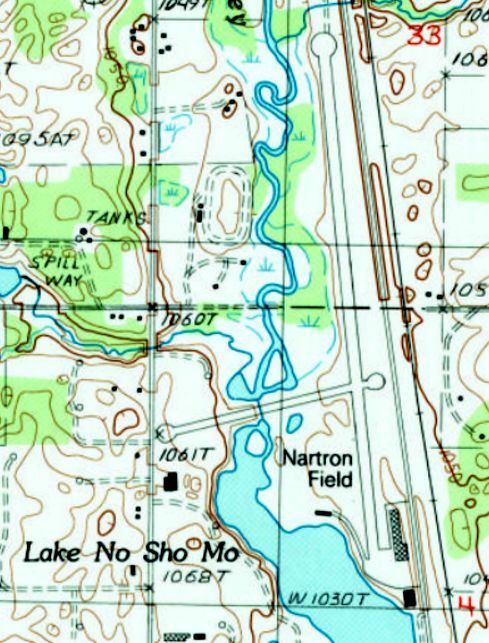 The 1963 USGS topo map depicted Mason Landing Field as having 3 unpaved runways. There were no buildings depicted on the field. 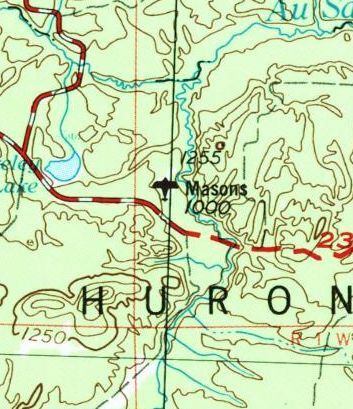 It was still depicted as Mason Landing Field on the 1983 USGS topo map. 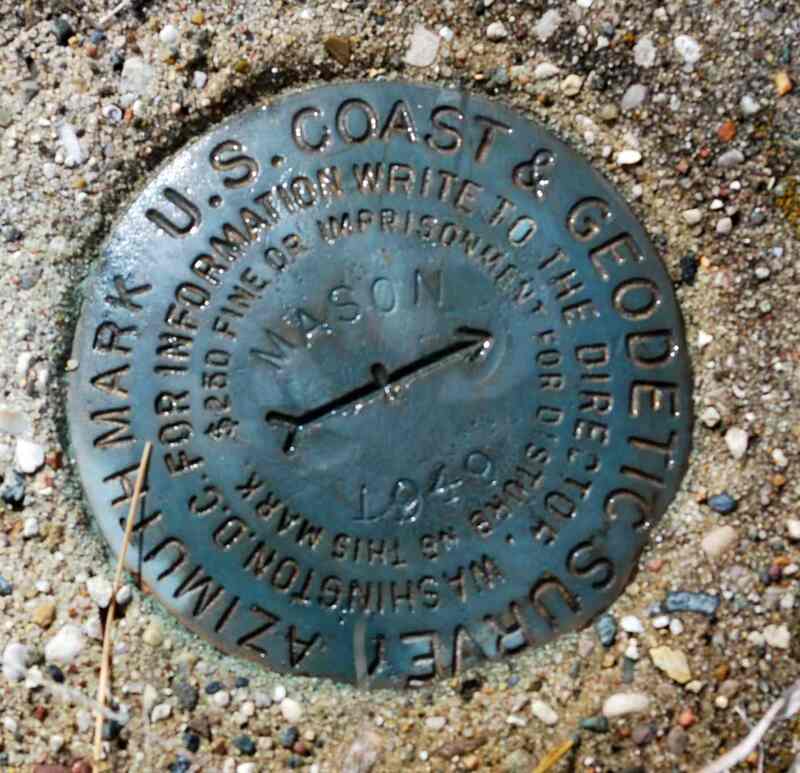 as that is how it was labeled on the 1989 USGS topo map. A 1992 USGS aerial view looking northwest showed Kelleys Airport remained intact, but without any sign of any recent aviation usage. A 9/23/14 aerial view looking southeast by Randy Coller showed Kelleys Airport remained intact, but without any sign of any recent aviation usage. A 9/23/14 photo by Randy Coller of the foundation of a T-hangar on the northwest side of Kelleys Airport. Randy Coller reported, “I walked the entire length of one runway & most of the length of the 2nd runway. The runways overgrown with trees - no markings, no windsock. Automobile tire ruts on the runway. Trees are growing on the runways. No based aircraft. No evidence of use. The airport is unsuitable for aircraft. 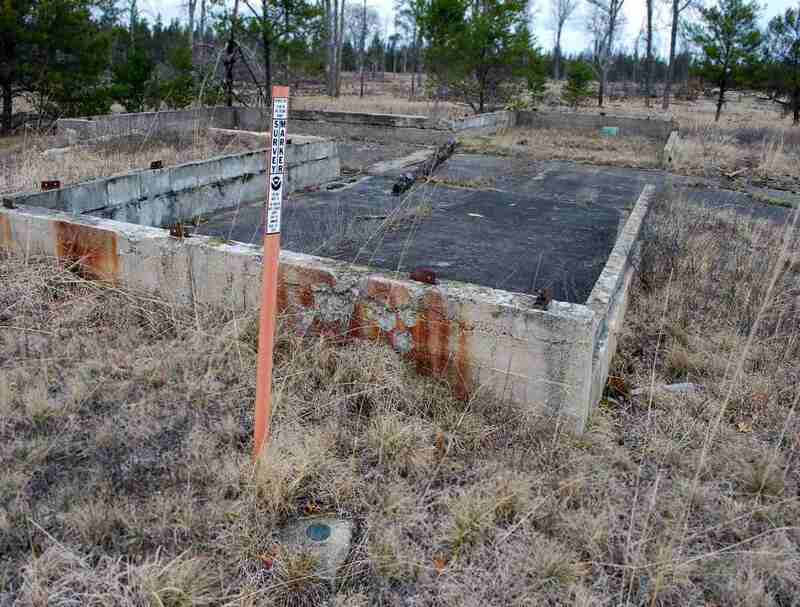 A 4/21/15 photo by Randy Coller of a USGS survey marked next to the foundation of a T-hangar on the northwest side of Kelleys Airport. As of 2015, the FAA Airport/Facility Directory described Kelleys Airport as having 3 turf runways, with the longest being 3,700' Runway 18/36. The owner was listed as James Kelley. However, Randy Coller reported, “I called the U.S. Forest Service on 5/13/15. They verified that the site is owned by the Forest Service & they wish to have the site abandoned as an airport. 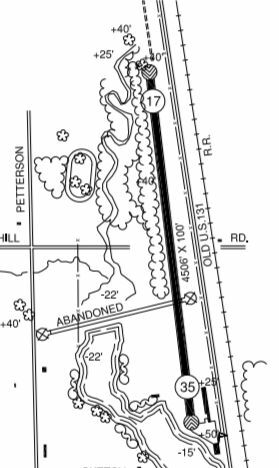 The site of Kelleys Airport is located northeast of the intersection of Oxbow Road & Route 72. 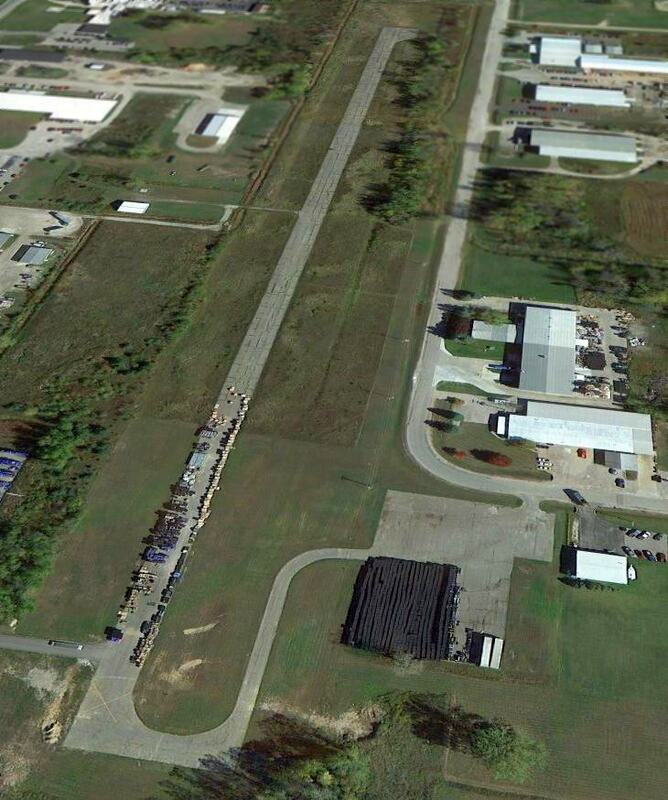 Thanks to Randy Coller for pointing out this airfield. 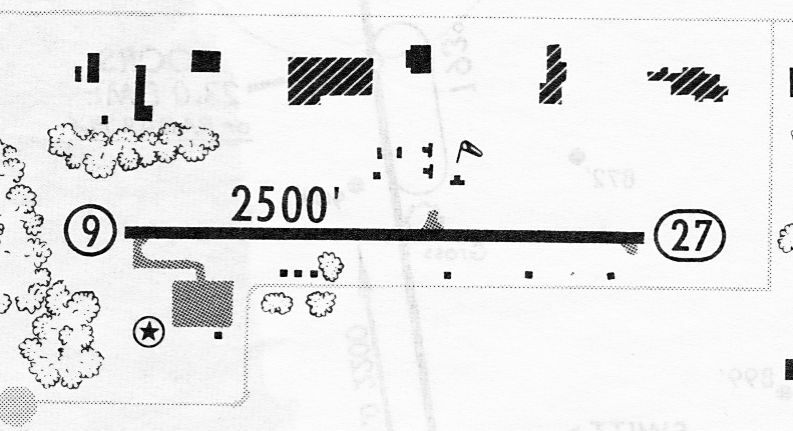 Vanderbilt Airport, as depicted on the December 1943 Green Bay Sectional Chart. 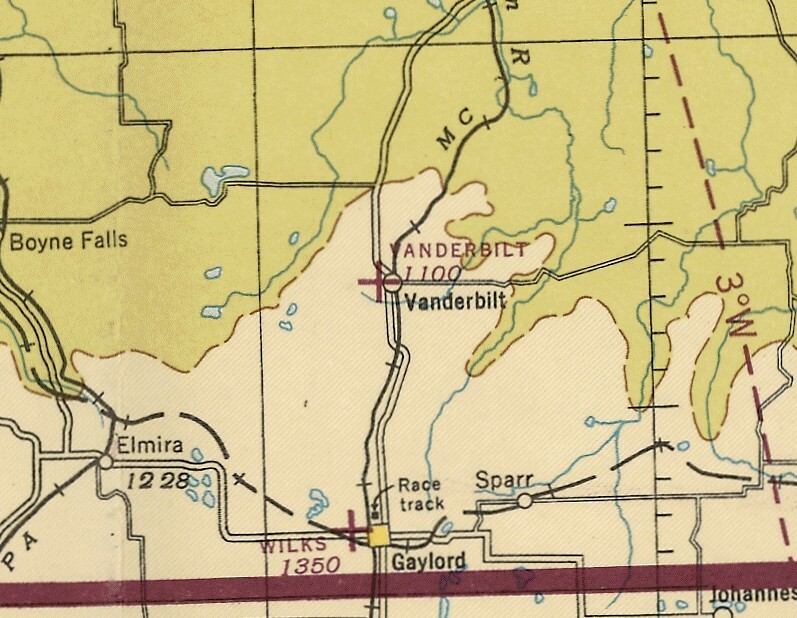 The original airport for the town of Vanderbuilt was located adjacent to the west side of the town. The date of establishment of Vanderbilt Airport has not been determined. was in the 1938 Commerce Department “Descriptions of Airports & Landing Fields in the U.S.” (courtesy of Mike Denja). 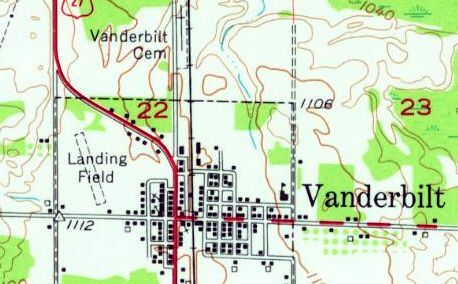 It described Vanderbilt Airport as a municipal field located ¼ mile west of Vanderbilt on the south side of U.S. Highway 27.
measuring 1,800' north/south & 1,400' northeast/southwest. 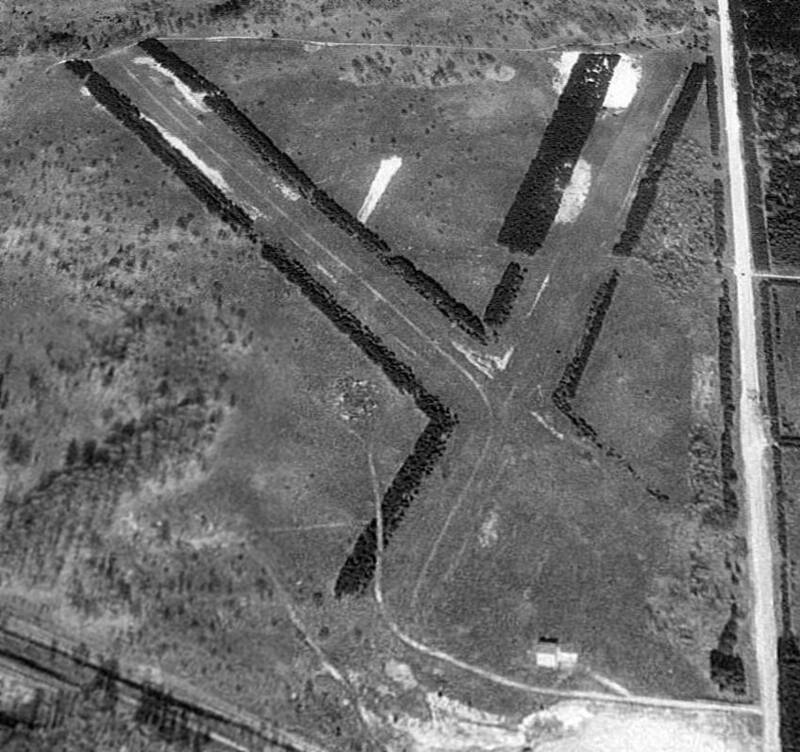 which depicted it as an auxiliary airfield located adjacent to the west side of the town. as a single unpaved northwest/southeast runway adjacent to the west side of the town, labeled simply as “Landing Field”. Note that this is a different runway configuration than described in 1938, so this may have been located in a slightly different spot. as the 1955 USGS topo map showed the property had been covered by the new Interstate 75. 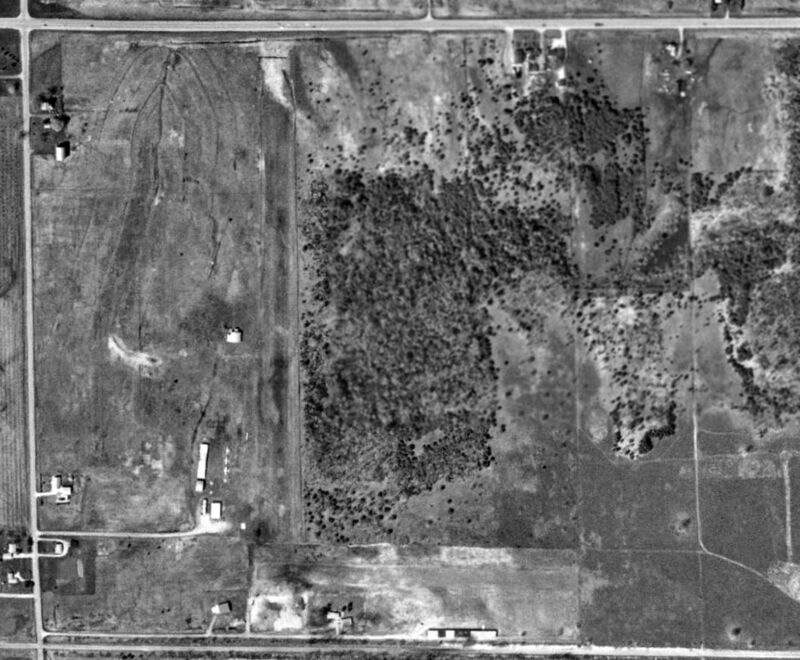 The earliest photo which has been located of Vanderbilt Airport was a 10/24/52 USGS aerial view. 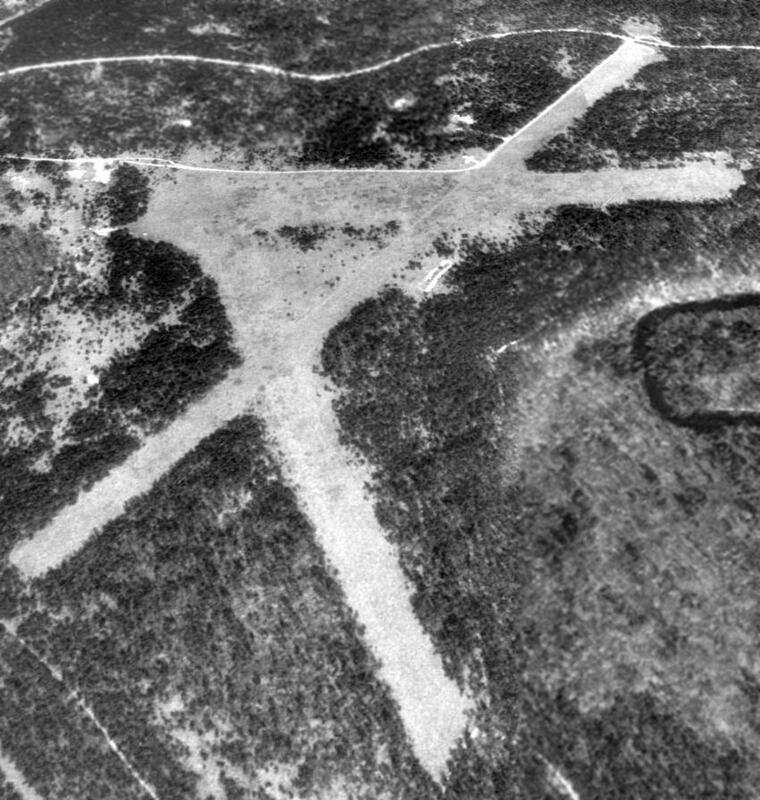 It showed traces of a grass northwest/southeast runway, with an airport circle marking in the center. and there was no indication of any recent aviation use. 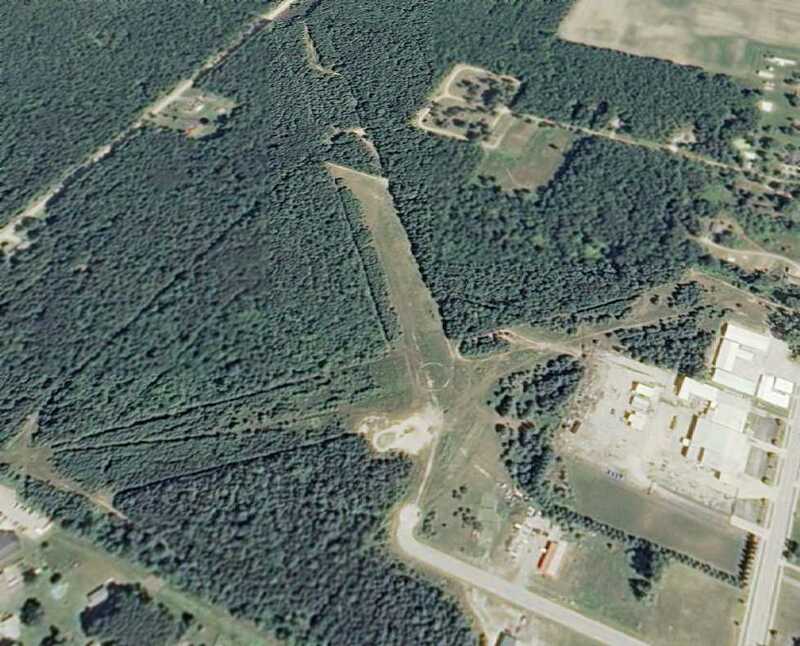 A 2014 aerial view showed no trace of Vanderbilt Airport, with Interstate 75 covering the site. 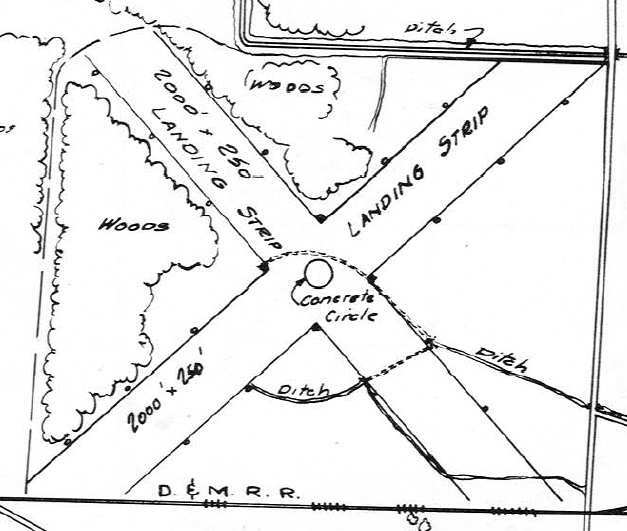 The site of Vanderbilt Airport is located northwest of the intersection of West Main Street & Lafayette Street. 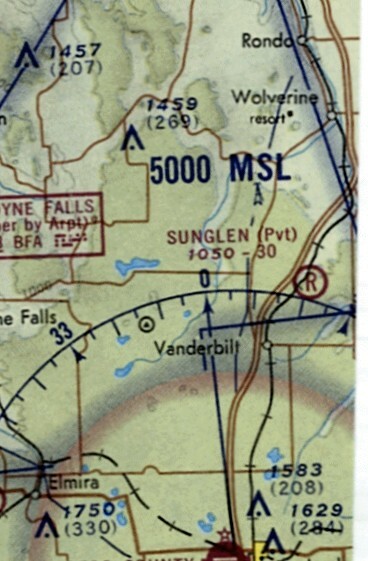 Sunglen Airfield was depicted on the August 1971 Green Bay Sectional Chart as a private airfield. after Vanderbilt Airfield was covered by construction of Interstate 75.
it may have served as their private airfield. 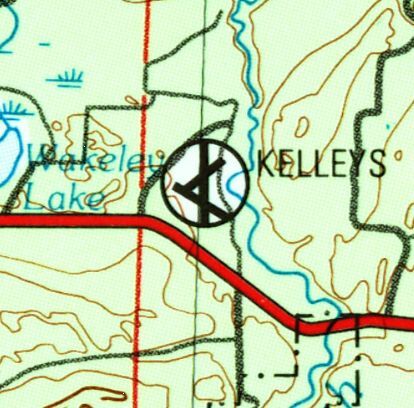 as it was not yet depicted on the 1955 USGS topo map. which depicted Sunglen as a private airfield with a 3,000' unpaved runway. Sunglen Airfield was depicted on the 1979 USGS topo map (courtesy of Mike Denja) as 2 runways, but without any label. 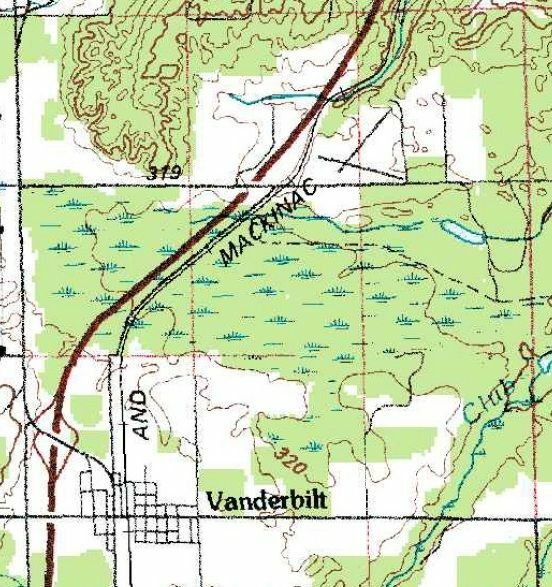 Sunglen Airfield was not depicted on the 1986 USGS topo map. 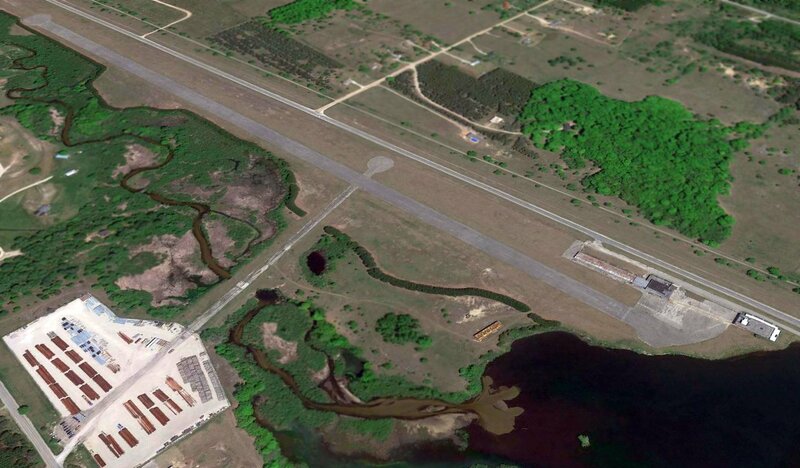 which depicted 2 unpaved runways with a small hangar on the west side. A 2013 aerial view looking east at Sunglen Airfield showed the runways remained clear. A 2014 aerial view by Greg Wilson looking east at Sunglen Airfield showed the runways remained clear. No airfield at this location was depicted on the 2014 Sectional Aeronautical Chart. 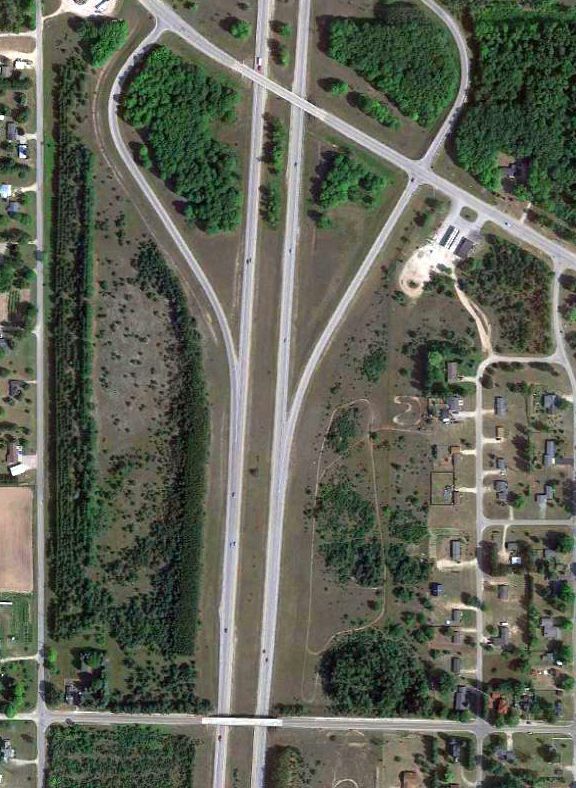 Sunglen Airfield is located northeast of the intersection of Interstate 75 & East Alexander Road. Thanks to Greg Wilson for pointing out this airfield. 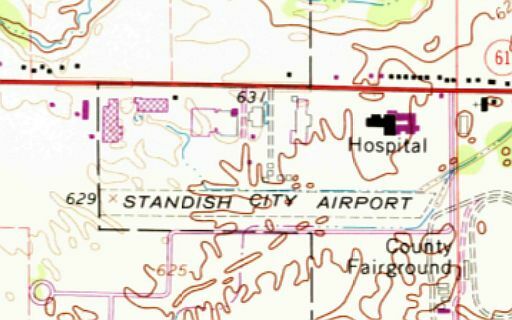 Standish City Airport, as depicted on the 1967 USGS topo map. The earliest depiction which has been located of Standish City Airport was on the 1967 USGS topo map. It depicted Standish City Airport as having a single unpaved east/west runway, with a few small buildings on the north side. 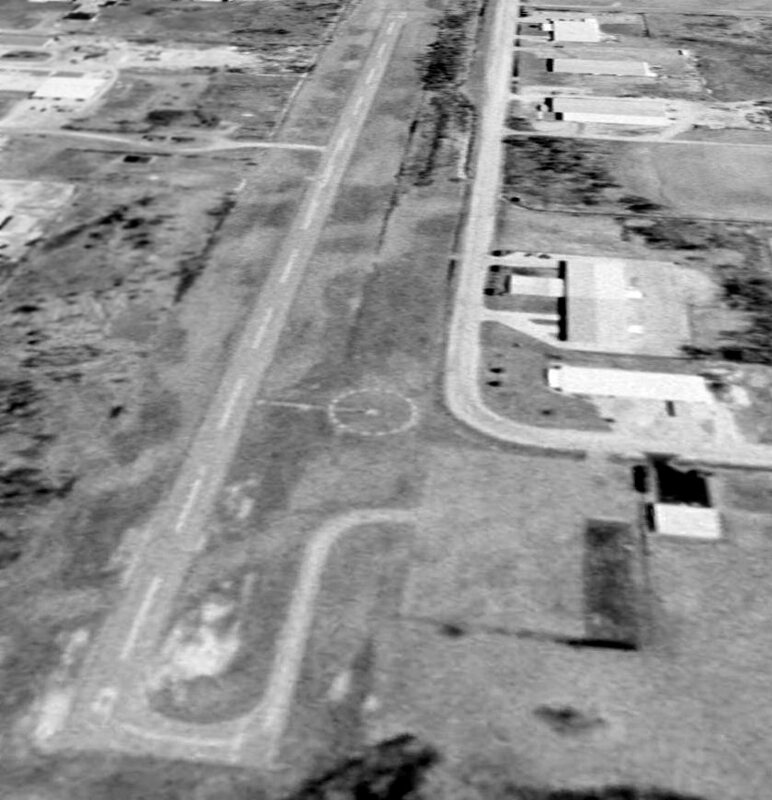 The earliest photo which has been located of the Standish City Airport was a 5/21/66 USGS aerial view (courtesy of Mike Denja). It depicted Standish as having a single east/west runway 9/27, with 1 single-engine aircraft & 5 T-hangars on the north side. 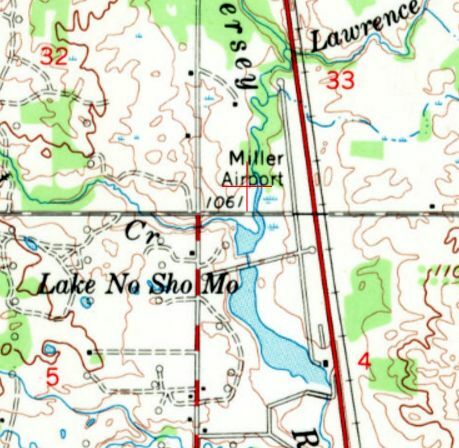 The 1974 USGS topo map depicted Standish City Airport in the same fashion as the 1967 topo map. and several T-hangars on the north side. The 1985 USGS topo map labeled it as “Municipal Airport”. A 4/9/99 USGS aerial view looking northeast depicted Standish City Airport as having a single paved Runway 9/27, with a paved ramp on the southwest side. which showed one single-engine aircraft on the ramp. 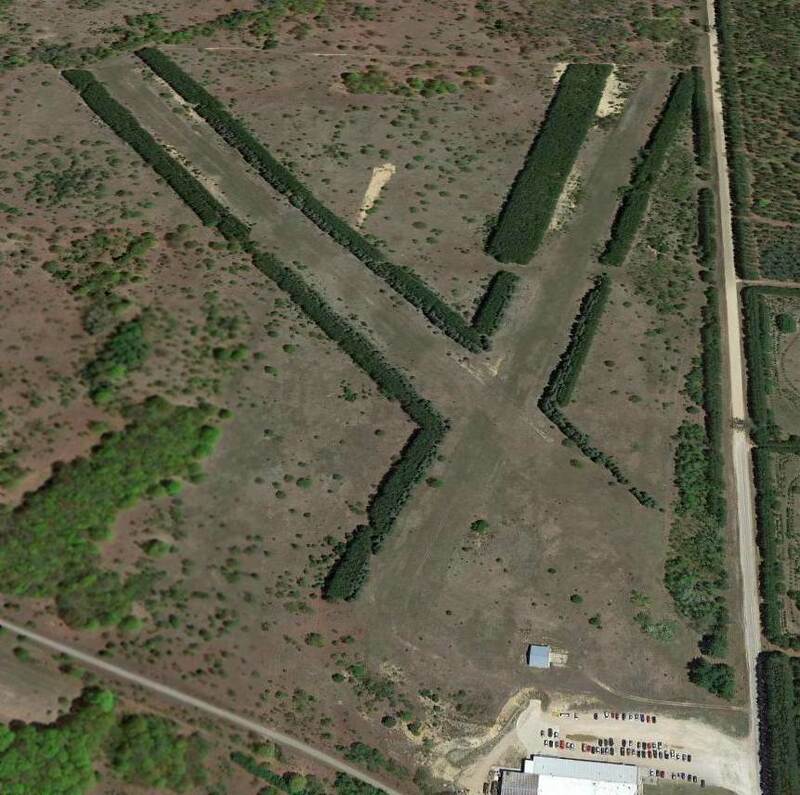 A 10/9/13 aerial view showed closed-runway “X” symbols painted on the Standish runway. A large quantity of unknown objects were being stored on the runway & the ramp. According to Wikipedia, Standish Industrial Airport was closed possibly in 2006. Standish Industrial Airport was owned by the City of Standish, and the manager was Greg Norgan. It had a single 2,500' asphalt Runway 9/27, “in fair condition”. Standish Industrial Airport is located southwest of the intersection of West Cedar Street & Airpark Drive. 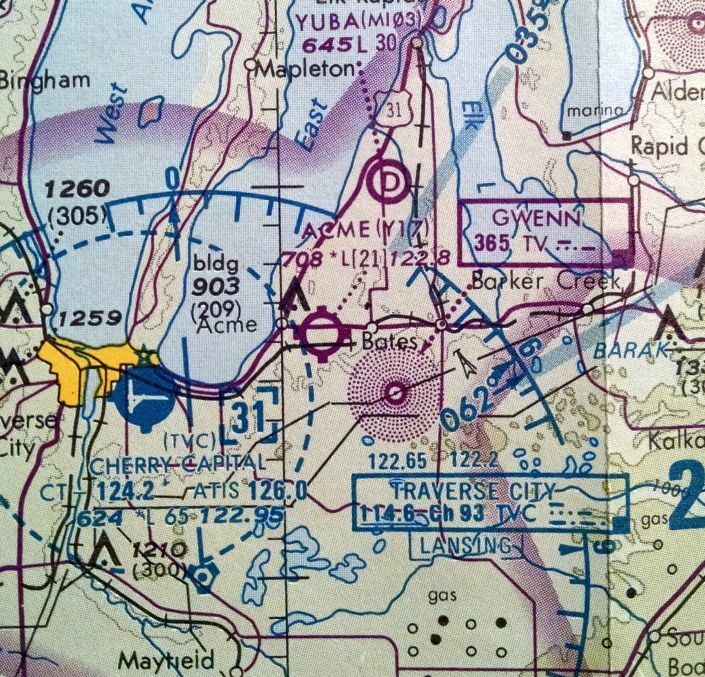 Au Gres Airport, as depicted on the 1944 Lake Huron Sectional Chart (courtesy of Chris Kennedy). according to a postmark commemorating the occasion (courtesy of Mike Denja). It described Au Gres as having two 2,000' grass runways. described Au Gres in the same manner. 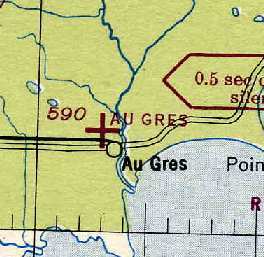 depicted Au Gres as having two 2,000' turf runways. 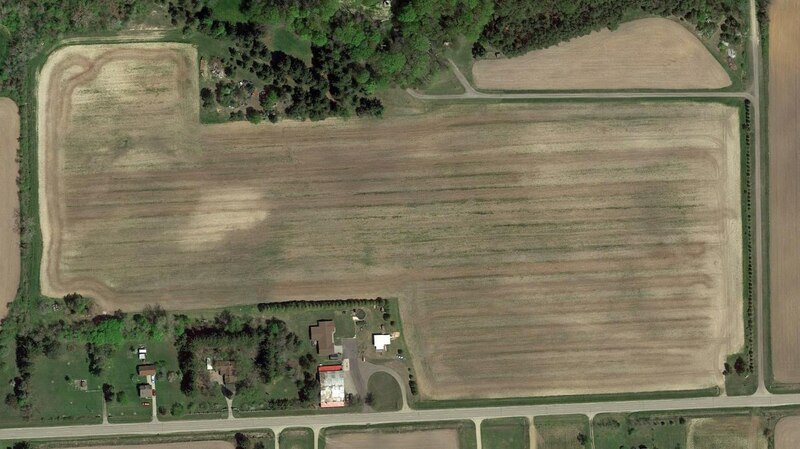 described Au Gres as having two 2,000' sod runways: 4/22 & 13/31. was on the May 1965 Lake Huron Sectional Chart (courtesy of Ron Kunse). 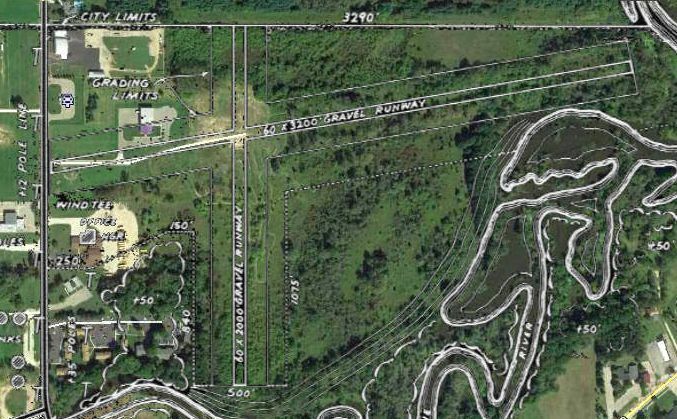 It depicted Au Gres as having a 2,000' unpaved runway. 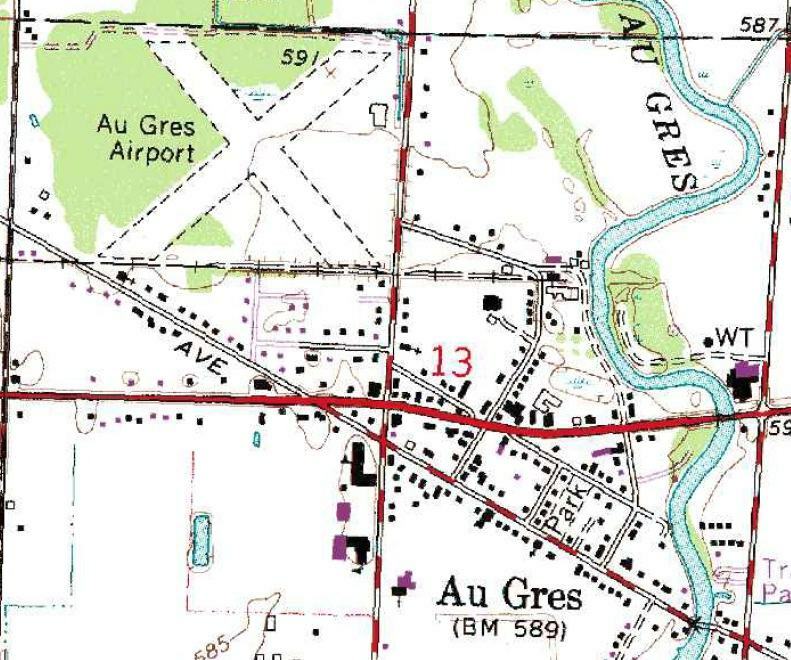 The last depiction which has been located showing Au Gres Airport while in operation was on the 1976 USGS topo map (courtesy of Mike Denja). It depicted Au Gres Airport as having 2 unpaved runways, with a single building on the northeast side. described Au Gres as having two 2,000' sod runways: 5/23 & 14/32. as it was not listed in the 1986 Flight Guide (according to Chris Kennedy). and a new street had been built over a portion of the southeast end of Runway 14/32. However, the outline of the majority of both runways still remained quite recognizable. 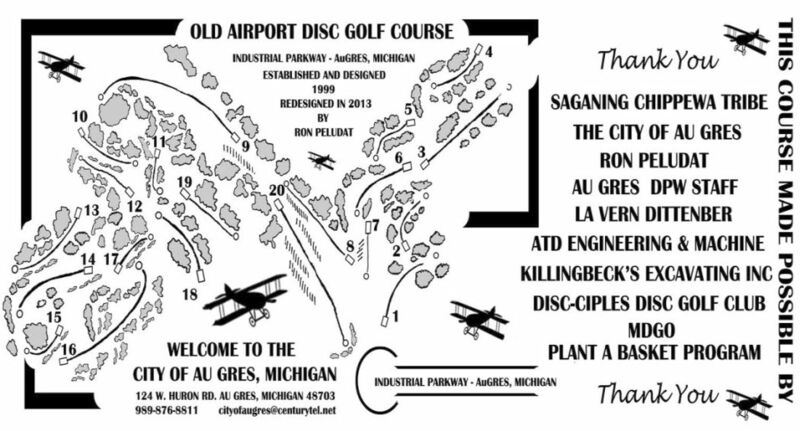 The “Old Airport Disc Golf Course” was established in 1999 on the site of Au Gres Airport. In a 7/26/10 aerial view looking northwest, the outline of the majority of both runways still remained quite recognizable. 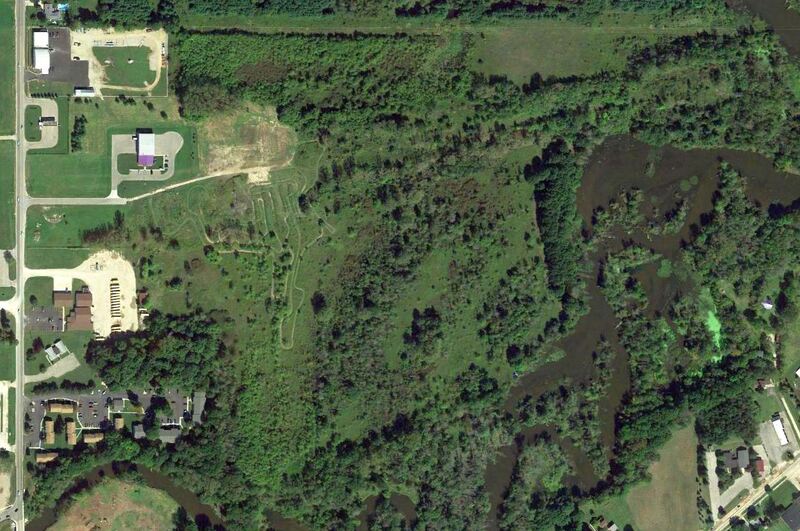 A 2013 map of the “Old Airport Disc Golf Course” located on the site of Au Gres Airport (courtesy of Mike Denja). 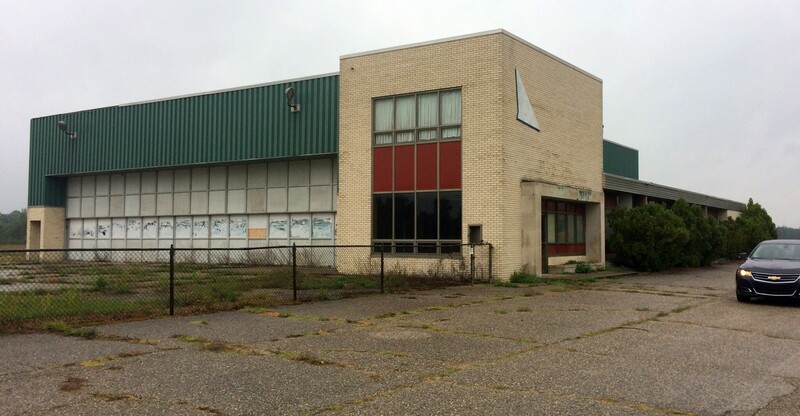 The site of Au Gres Airport is located northwest of the intersection of North Court Street & West Cherry Street.